mk North America announces the expansion of capabilities of theVersaMove product line – an innovative solution for pallet conveying and automation. Fabricated out of mk aluminum extrusion, the VersaMove pallet handling systems are flexible, versatile, and designed to deliver industry-leading solutions in the ever-changing automated assembly and testing automation industries. mk North America has been developing pallet systems for 20 years, and recently strengthened its offering of the three different VersaMove pallet system platforms: VersaMove Standard, VersaMove Plus, and VersaMove Ultra. These three systems can collectively accommodate almost any load requirement. All of these options are adaptable, allowing for easy expansion and redesign, along with the ability to quickly, and easily, mount to the conveyor frame. 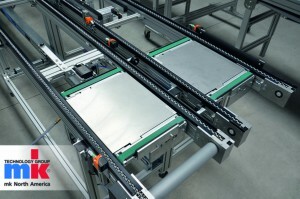 Although VersaMove Standard is designed for conveying smaller, lighter pallets, it is by no means a light duty system. Additionally, due to mk’s recent innovations and enhancements, the VersaMove Standard System can now accommodate pallet loads weighing up to 80 lbs. each. The other systems in the VersaMove line continue to offer larger capacities. VersaMove Plus allows for the widest range of pallet sizes, with a pallet conveying capacity of up to 250 lbs. each. Completing the VersaMove line is the VersaMove Ultra, mk’s most robust and rugged pallet conveyor system. Developed to carry the largest pallets with loads up to 700 lbs., these units are designed for high-load accumulating applications. However, despite their load capacity, they are still versatile enough to be used for lighter duty conveyor systems as well. All of the VersaMove Systems feature a unique enclosed return allowing for a safer and more complete system. With the VersaMove System, mk continues to innovate pallet conveying and automation to drive efficiency and productivity, as well as workplace safety, by providing safe, ergonomic solutions to a multitude of industries. The VersaMove System is designed to arrive ready to uncrate, offering simple integration into the work flow. This ease of deployment has become a signature tradition of mk, and improves efficiency by ensuring minimum downtime to enhance the conveying system. A wide variety of industries have utilized mk’s innovative designs since the company was founded in 1988, including (but not limited to) automotive, household appliances, medical, and defense. Trusted in Canada, the United States, and Mexico, mk continues to deliver pallet systems, low profile conveyors, aluminum framing systems, and more to enhance manufacturing and distribution operations. Product innovation, reliability, and application knowledge help drive mk’s mission to enhance client-business’ success. Readers may view the VersaMove brochure on the company website.